Even after the runaway success of the Dota 2 International Compendium and the $10 million prize pool it crowdfunded, Riot Games have decided to stick to a relatively tiddly $2m pool for the LoL Championship Series this year. 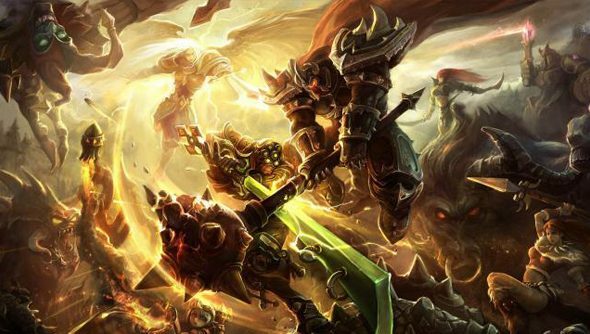 It’s part of a plan to ensure League of Legends will be around for decades to come. Riot’s head of EU eSports Jason Yeh told Polygon that the developers are dedicating a larger chuck of their coffers to strengthening League infrastructure than to prize pools. The plan is to copy established sporting event convention by eventually running pro-LoL events on a weekly basis. Another Riot representative said that the company isn’t interested in building an annual prize pool via crowdfunding, report Polygon. They can foresee long-term issues with that approach – for instance, the “disaster” of an annual tournament winding up with less money to its name than the year before. Valve contributed just $1.6 million of the Dota 2 International’s eventual prize pool – but announced in May that a $2.50 portion of every Compendium sale would top up the total. Dota players bought enough copies of the digital event guide and betting book that Valve split $10.7m between the International’s winners last month. The event was an unambiguous success – the 2014 International doubled last year’s peak online viewer numbers. Would you prefer to see Riot follow suit, or are you content to let them follow their own business sense?